If you encounter an issue and you are not able to solve it by yourself, the best idea is to contact us. A properly prepared report will be easier to understand for our team and will also guarantee that the problem is fixed as quickly as possible. A chaotic, vague description will usually bring the opposite effects - it will be hard to understand for our support team and for developers, and analyzing it will require additional time and effort. Describe the problem in one sentence. Do not mention any other problems that you are experiencing at the same time, even if they seem related. It is best to include one issue per report. 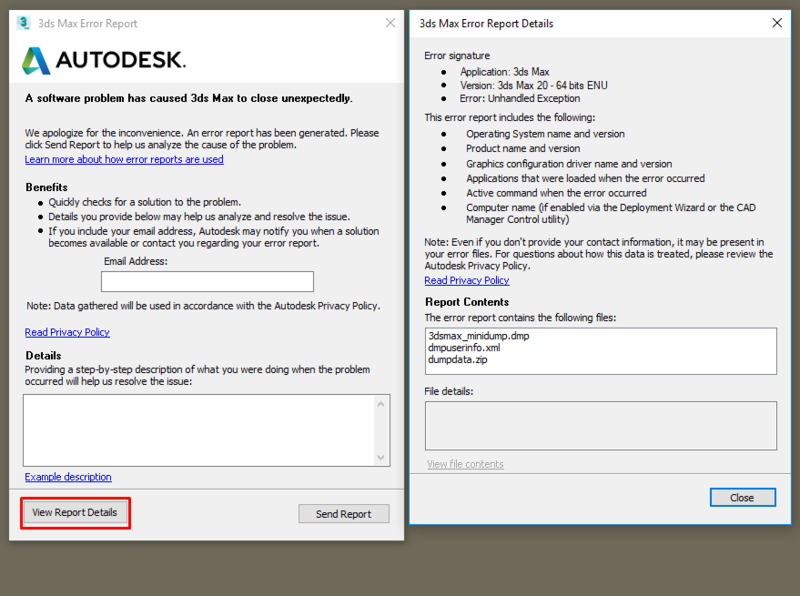 Good example: "3ds Max crashes when creating a Corona Light object"
Bad example: "My 3ds Max crashes and I don't know why.... maybe it is related to the other bug I reported on the forum! Please help!" Short description of what exactly you did right before the problem appeared, and what exactly happened afterwards. 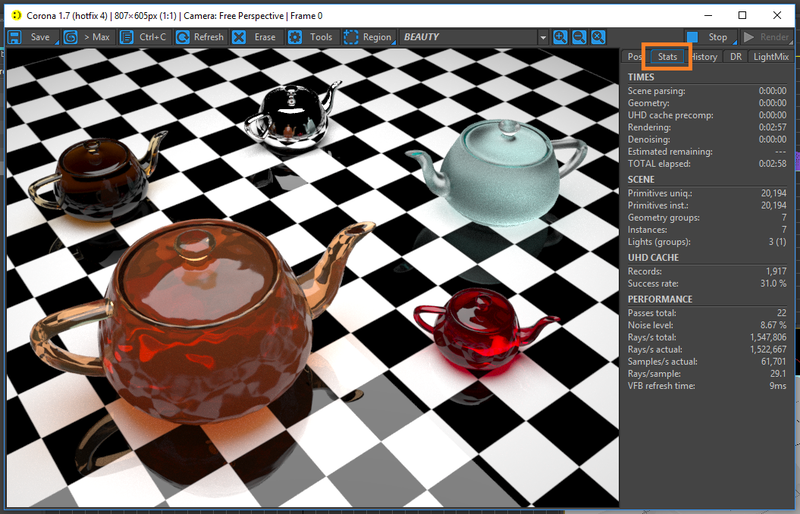 Good example: "I selected my active camera, then created a new Corona Light object, then enabled "visible in reflections" option. 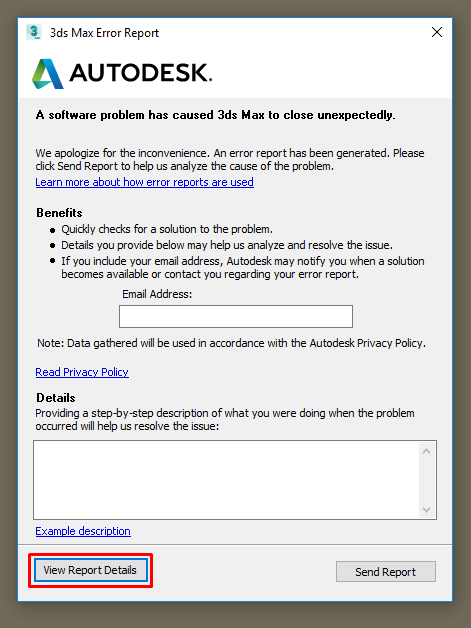 When I tried to render, 3ds Max crashed with an error message." Bad example: "I click render. Then computer freezes." In case of crashing or freezing - attach a 3ds Max minidump file (more details how to do it can be found below in points 1 and 2). Add screenshots of render settings, material editor, or any other UI elements that might be helpful. If you changed some render settings - show us what settings you are using. If you created some non-standard material (maybe using a plugin?) - show us your material setup. If there is slow rendering, problems with pre-rendering stage, etc. - show us the "stats" panel of the Corona VFB. Attach any other screenshots that you think may help us identify the problem. The more, the better. Host your problematic scene using our uploader and let us know what's the file name. We accept files up to 10GB (using the Dropbox option). Be sure to notify us about the uploaded file, and let us know what is the file name. If possible, send a video showing the issue. Videos are priceless when it comes to reporting bugs, and if we are able to reproduce a bug on our end, then there is a big chance that we will fix it. Recording a video can be a time-consuming task though, so we can understand it if you simply do not have time for this, or do not want to do it. A good freeware application for screen recording is OBS Studio. Use points (1...2...3...) and short, easy to understand sentences. This is much more convenient than writing long, elaborate descriptions. Report your issue in one place only, rather than sending us messages through the forum, support portal, bug tracker, and by email at the same time. Duplicate reports may cause a lot of confusion, and in turn will make the problem solving process much slower. It is best to report the issue in one place, and patiently wait for a reply. We do our best to reply within 24 hours from the original report, and usually this time is much shorter. Always provide information which Corona and 3ds Max version you were using. Your report will be logged as a ticket in our support system, and one of our agents will contact you as soon as possible. We do our best to reply within 24 hours from the original report, and usually this time is much shorter. Our working hours are Monday - Friday 10:00 - 18:00 CET. You are welcome to report bugs on our forum. There is a chance that our support agents or developers will spot our forum thread and will contact you about further information, or that the Corona Renderer community will provide you with help without the official team's intervention. This method does not however guarantee that your issue will be thoroughly checked by the team, and there is a (small) chance that it will be overlooked. Using the support portal is definitely the preferred solution for dealing with serious bugs and urgent help requests. Private uploader. You can use it to host large scene files (up to 10GB) related to your bug reports, and then notify us about it. What is the minidump file? A minidump file contains information that allows us to understand an issue (such as what exactly happened during the 3ds Max crash or freeze), and helps our developers provide a fix, or at least an explanation, as soon as possible. How to get the 3ds Max minidump file? 2. Click on "View Report Details"
3. Hover your mouse over each file to see its location. We need the .dmp file. 4. Go to that location and find the .dmp file. 5. Archive the .dmp file using software of your choice (.zip, .rar, .7z will work fine) - this way the dump file may get even 10 time smaller! 6. Send it to us along with the description of the problem. The preferred contact channel is our support portal. You can host your minidump using our uploader and let us know in the report what's the file name. Additionally, please provide us with information which Corona version you are using! 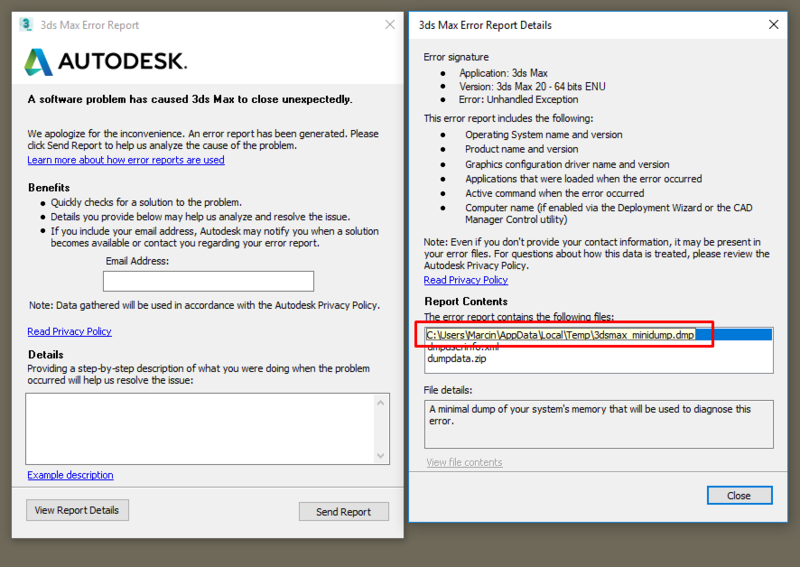 When the error message appears, or during the freeze, run the Process Explorer, find "3dsmax.exe" process, select it and go to Process > Create Dump > Create Minidump... then save the file in a desired location and upload it to us. The preferred contact channel is our support portal. You can host your minidump using our uploader and let us know what's the file name. Additionally, please provide information which Corona version you are using! If you can't find any solution to your problem in our helpdesk and you suspect it's a bug, please submit a new support ticket. Describe your problem carefully and include the problematic scene if it's possible. 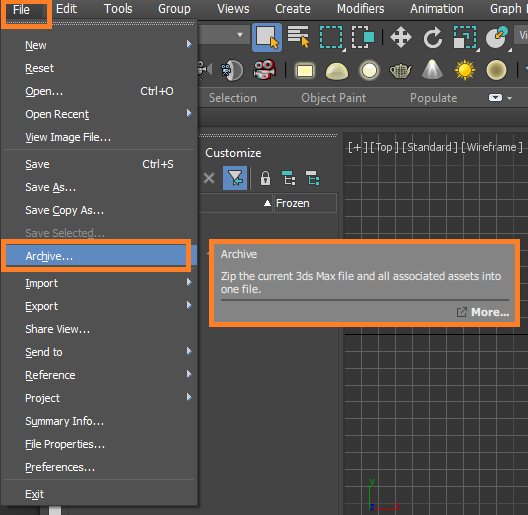 The best way to save the whole scene with all models, textures and other assets is using the "Archive" option in 3ds Max. If your scene is still big after archiving it, it is best to simplify it as much as possible while still preserving the problem. You can then host your scene using our uploader and let us know what's the file name. If you encounter problems with Distributed Rendering and you can't find solution in Distributed Rendering Troubleshooting section, please submit a new support ticket with the description of the problem and additionally attach the DR logs from the unsuccessful rendering. We will analyze the log files and will return to you with our findings as quickly as possible.